Norcott Technologies » News » Norcott’s Director of Engineering and Raspberry Pi Team receive prestigious MacRobert Award…. His Royal Highness the Duke of Kent last night presented the UK’s top engineering innovation prize – the Royal Academy of Engineering MacRobert Award – to the team of engineers behind Raspberry Pi, the small but mighty microcomputer that has revolutionised control systems and redefined how people engage with coding. 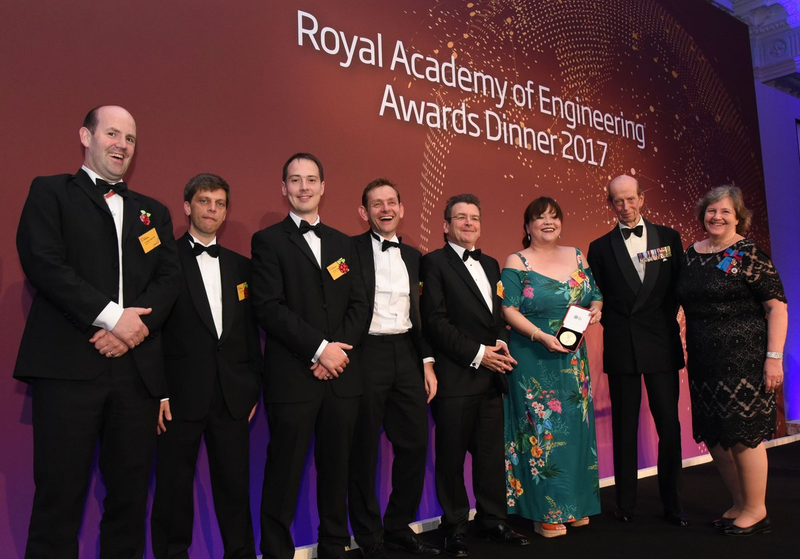 Known for spotting the ‘next big thing’, the annual MacRobert Award is presented to the engineers behind the UK engineering profession’s most exciting innovation. The winners receive both a gold medal and a £50,000 prize at the Academy Awards Dinner, hosted this year at the Landmark London Hotel. The winning team members are: Dr Eben Upton CBE, CEO; James Adams, COO; Pete Lomas, Director of Engineering, Norcott Technologies; Dom Cobley, Senior Principal Software Engineer; Gordon Hollingworth, Director of Engineering; Liz Upton, Director of Communications. The Raspberry Pi team with HRH the Duke of Kent and Professor Dame Ann Dowling OM DBE FREng FRS, President of the Royal Academy of Engineering. MacRobert Award winners are chosen by a panel comprising of, some of the most experienced names in UK engineering, who are all Fellows of the Academy. The arrival of closed ‘gaming platforms’ and the commercial personal computer led to an abrupt decline of accessible computing platforms that fostered curiosity, experimentation and innovation in the young . We absolutely wanted to reverse that if we could. However, the majority of the computing power today is hidden in everyday objects. It enhances their functionality, simplifies their design and reduces costs and with internet connectivity opens up a multitude of opportunities and unfortunately threats. We desperately need more engineers in these fields who have the skills to benefit the UK and global economies. This was a key reason that a plethora of interfaces were added to the design. Children now not only print “Hello World” on the screen they flash LEDs using code, drive motors and interact with a wide variety of sensors. I’m particularly passionate about this “digital making” capability as it encapsulates what the design team here at Norcott do. We take client brief, the concept/idea, and turn this into a viable product design. At the same time we take a holistic view of the process encompassing not just design but, manufacturing process, scalability, serviceability, end of life, compliance and importantly cost-point. We work closely with our clients to hone the feature set, optimise the design for efficient manufacture, and develop effective test and repair strategies. We are always looking for ways to enhance and innovate, so that we keep our clients at the forefront of their technical field.